Heart Disease information EVEN your child can understand ! Get the latest heart news by e-mail. Books on Heart Disease hand-picked for their excellence and usefulness. Brought to you in association with Amazon.com, the largest bookstore on Earth ! Order now directly from this page and get attractive discounts. 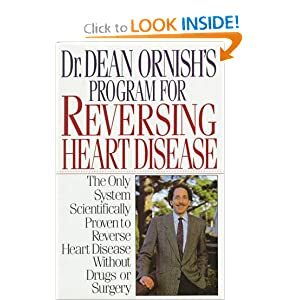 In this breakthrough book, Dr. Dean Ornish presents the first scientific proof that it is possible to actually reverse heart disease without drugs or surgery. Dr. Ornish's internationally acclaimed scientific study, funded in part by the National Institutes of Health and based on thirteen years of research, has yielded astonishing conclusions: Heart disease can often be halted or even reversed -- without bypass surgery, angioplasty, or cholesterol-lowering drugs -- simply by changing our life-style. Participants in Dr. Ornish's study, all of whom had severe coronary heart disease, followed his extraordinary Opening Your Heart program with amazing results: their chest pain diminished or disappeared; they often were able to reduce or discontinue medications; they felt more energetic, happy, and calm; they lost weight while eating much more food; and in most cases the average blockages in their coronary arteries began to reverse. In fact, the more severely blocked arteries showed the most reversal. In contrast, the coronary blockages of most of the patients who followed their doctors' recommendations became worse instead of better. Dr. Ornish presents the dramatic evidence from his study and guides readers step-by-step through the Opening Your Heart program, which combines a special Reversal Diet (featuring over 150 delicious, all-you-can-eat recipes from such culinary stars as Mollie Katzen, Deborah Madison, Wolfgang Puck, and Alice Waters); a Prevention Diet; meditation; visualization; communication skills and other stress management techniques; and advice on how to stop smoking and how to exercise safely and moderately. More men and women die from coronary heart disease each year than from all other causes of death combined, including cancer and AIDS. Now, since heart disease can be reversed, then it may be preventable for most people. "EVEN WITH A HEALTHY HEART, READ THIS BOOK FOR A HEALTHY MIND"-- A reader. The only heart care program scientifically proven to reverse heart disease without drugs or surgery. Takes the reader through each step of the Ornish program, demonstrating methods for lowering cholesterol, improving blood flow, reducing chest pain, and increasing energy levels for happier and healthier lives. More women between the ages of 44 and 65 die of heart disease than from all types of cancer combined. "Her Healthy Heart" provides detailed information on how women can reduce their risk of heart disease by making changes in diet, increasing physical activity, and managing stress. "What you don't know can kill you," writes Linda Ojeda in Her Healthy Heart. For example, did you know that heart disease and stroke are killing women in record numbers--six times as many as breast cancer, and twice as many as all forms of cancer combined--yet can be prevented and reversed with small lifestyle changes? Ojeda goes beyond the eat-low-fat-and-exercise advice we've all heard a million times. She discusses nutrients, supplements, stress, spirituality, and unhealthy vs. heart-healthy behavior. She describes what conditions and actions increase risk, and what you can do to reverse the effects, with every point backed up by scientific studies. Where there's conflicting information, she presents both sides and makes her best recommendation. Ojeda wrote Exclusively Female before women knew they could alter the way they felt before and during their periods, Menopause Without Medicine before the great flood of menopause books, and Safe Dieting for Teens, the first dieting book aimed at teenagers. Now she again shares the science we haven't heard, this time for our hearts' sakes. Most research on heart disease, the number-one killer of women, has been conducted on men. Ojeda, author of books on natural health, offers in this handbook a balanced view of women and heart disease by interpreting recent and often conflicting research. A comprehensive guide to the heart offers a fundamental explanation of the workings of the heart and the circulatory system, as well as information on cardiovascular disease, medical treatments, and cardiac health. 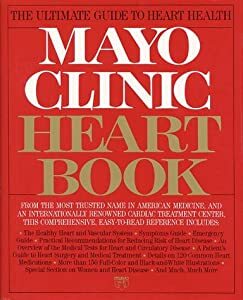 The world-renowned Mayo Clinic cardiology department--rated #1 in a 1992 US News and World Report survey of 1,000 doctors--presents a resource for the 70 million Americans affected by cardiovascular disease, featuring 130 contributors, nearly 100 illustrations, and 75 color images. A thorough, detailed, clear, and non-condescending presentation for the lay reader. 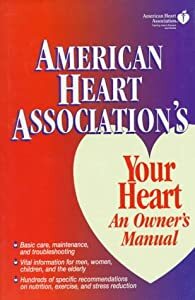 Covers heart anatomy, discussion of various kinds of heart disease, how to reduce risk of coronary artery disease, diagnostic tests, treatment, and special issues such as the intake of aspirin, fish oil, and coffee; whether all palpitations should be treated; women; and participation in medical research. Here's an owner's manual with a twist: attention to troubleshooting and stress reduction as well as understanding heart operations and recovery processes is contained in an 'owner's manual' format packed with case history examples contrasting various care routines. An excellent, easy to understand guide which couches health terminology in layman's lingo. Due to incredible advances in the diagnosis and treatment of cardiovascular disease, the death rate from heart attacks has been steadily declining for the past ten years. Despite this, disease of the heart and blood vessels still causes half of all the deaths in our society. This book provides essential information for recognizing the symptoms of heart attack and providing appropriate treatment. Written in an easy-to-understand style, it helps the reader to quickly grasp the key issues involved in diagnosing and treating heart disease. The text is ideal for review, or as a companion to major cardiology textbooks. "...... a comprehensive book to help you battle America's #1 medical problem, heart disease." Copyright © 1997-2013 Heart Disease Online , All rights reserved.